This op-ed originally appeared on Ebony.com. Marissa Alexander is a 33-year-old African-American woman who stands accused of three counts of aggravated assault with a firearm after firing a warning shot to ward off a violent husband whom she believed was attempting to kill her. The shooting occurred after her husband assaulted her multiple times---once landing her in the hospital with head injuries---and after he made credible threats to kill her. Nevertheless, a Florida state court rejected her self-defense argument, specifically the “Stand Your Ground” defense. Angela Corey, the same state prosecutor who unsuccessfully prosecuted the killers of Trayvon Martin and Jordan Davis for murder, is now seeking to imprison Alexander for up to 60 years, effectively placing a life sentence around a Black woman who—unlike George Zimmerman and Michael Dunn--had every reason to believe her life was in danger. As I wrote about in a blog in 2012, magician, Teller, half of the famous “Penn & Teller” duo, brought an interesting and perhaps unprecedented copyright infringement claim against a Dutch magician, Gerard Dogge, who made of video of a “strikingly similar” illusion, posted it on Youtube and offered to sell DVD’s and reveal the “secret” of the illusion (which, in this case he appears to claim is different from Teller’s method). After several procedural rulings since then, in a decision on March 20,2014, Judge Mahan in the U.S. District Court for the District of Nevada gave summary judgment to Teller on the copyright infringement claim, finding that Dogge had essentially admitted access, and there was not even a genuine issue of material fact on “substantial similarity” under both the “extrinsic” (objective) and “intrinsic” (more subjective, “total concept and feel”) tests used in the Ninth Circuit. Teller v. Dogge (2:12-CV-591 JCM)(D.Nev., 2014). This year we are celebrating the 50th anniversary of our law school campus. I love what an interesting space we inhabit in downtown Los Angeles, and I consider myself lucky to get to teach on such a unique and functional campus that has been designed with an artistic vision. But the campus, of course, really comes alive with all of us who spend our time here, and I wanted to share how I’m reminded of that on an almost daily basis. It is the time of the spring semester when law review boards change over and the faculty receives emails with the lists of students who will be taking the helms of the various journals at Loyola. I’m delighted to see current and former students on the lists, and I remember how busy my students are outside of the classroom. It is also the season for receiving emails from students, diligently letting me know that they have to miss a class because they are attending (and winning!) a trial competition. Sometimes I come across other interesting and important activities that Loyola students are up to and here’s a new one: – the dlreporter.com. The Dotted Line Reporter is a Loyola law student-produced blog that has excellent, timely content focused on business and legal developments in the entertainment industry. The blog provides lots of interesting info and analysis on a wide range of topics in film, television, music, sports, the arts, and more. The site is packed with content on trending topics I want to read – everything from the recent “Dumb Starbucks” parody to the Time Warner-Comcast merger. What is truly impressive is how many of the stories are not just the same sound bites you’d find on bigger, well-known blogs and websites but are rather original commentary and reflect thoughtful research. The “Dumb Starbucks” piece, for example, was the result of one of the student contributors actually going over to the faux coffee storefront and interviewing folks and sleuthing the story. What I also love about this new blog is how it reflects the entrepreneurial spirit of the students who have started it. I teach business law courses here at Loyola, and I try to bring to life the law we study – how the cases we read, for example in Business Associations, reflect scenarios where real people were pursuing innovative ideas, career or investment goals. The students creating the dlreporter.com have that entrepreneurial, industrious spark to use their interests to pave their own paths to success. 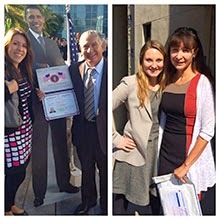 Clinical attorneys Marissa Montes ’12 (pictured, left) and Emily Robinson (second from right) ’12 recently joined their Home Base Immigration Clinic clients, Francisco and Sonia, in Los Angeles as they took their oaths to become new U.S. citizens. The clinic focuses on providing representation to individuals who are unable to obtain immigration legal services elsewhere, focusing on the community of Boyle Heights and East Los Angeles area, specifically the constituents of Dolores Mission and Homeboy Industries. The clinic is accepting students for the 2014-2015 academic year. Interested students must have taken or be concurrently enrolled in Immigration Law during the 2014 fall semester. They may apply by sending a resume, a current transcript and a one-page personal statement to hbic@lls.edu by March 14, 2014. This op-ed originally appeared on AlJazeera.com. In many ways, Hollywood is a fenced-off community. It serves as the guardian of public accolades for excellence in film and representation. Yet, its gatekeepers are still overwhelmingly white, male and old, while the world it seeks to depict is the opposite. The Academy of Motion Picture Arts and Sciences is no different from broader trends in Hollywood itself. The voters who determined the winners of the 86th-annual Academy Awards on Sunday, March 2 are a testament to the white homogeneity and hegemony in Hollywood. People of color have always been on the margins of Hollywood. Oscar nods to Hattie McDaniel, Sidney Poitier, Denzel Washington, Halle Berry and Jamie Foxx were generally lauded as moments of racial progress, allegedly highlighting an industry moving away from racial exclusion and toward diversity. Unmasking the meaning and motivations behind Hollywood “diversity” reveals that gatekeeper politics – not racial progress – dictates which people of color are let inside, and the shape, complexion and color of the faces that remain fenced outsides Hollywood’s gates. One can drive from Hollywood’s Dolby Theatre, the site for the Oscars, and easily take a route through a tapestry of Asian, Black and Latino neighborhoods. Yet, the images that are often celebrated within spaces like the Dolby Theater obscure or outright misrepresent the lives of people who live in communities of color, often relying on tired and outdated stereotypes.